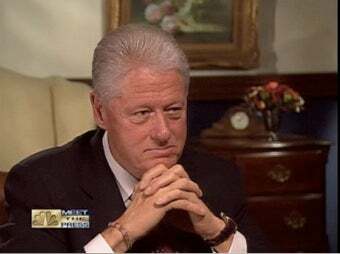 On this morning's Meet The Press, former President Bill Clinton claimed that the "vast right-wing conspiracy" that once targeted himself and his wife, Secretary of State Hillary Clinton, is now targeting President Barack Obama. Clip after the jump. Though Clinton believes the "vast right wing conspiracy" is still very much a presence today, he also argues that the negativity of the Republican party will hurt them in the end, as the Obama Administration is continuing to run on positive themes, as opposed to the Republican platform as of late, which, Clinton notes, "seems to be wanting [Obama] to fail, and that's not a prescription for a good America."